The professional, licensed roofers at Tony's Roofcare Inc. can complete a thorough inspection of your roof and determine if roof replacement is the best option at this time. If this is the case, we are a GAF Master Elite® Certified roofing installer that has met stringent guidelines to qualify for this level of professionalism. If your roof has to be replaced, the discussion will turn to resheeting if your home was built before 1970. Many roofs built decades agoused substrate from wood planks called shiplap to create a solid surface so shingles could be attached to the roof. These fir wood planks were used before the 1940s, when exterior grade plywood wasn’t an option. After the 1940s, shiplap remained less expensive because it was manufactured in the Pacific Northwest. By the 1970s, exterior-grade plywood became accepted as the norm for roof substrate. If your roof has shiplap, that means the roof deck is at least 50 years old. At this point, it has dried out considerably. The wood is brittle and there could be spaces between the boards where leaks could occur. These planks tend to have cracks and knot holes which could potentially leak as well. Sometimes a new underlayer is used to cover the shiplap and that can be damaged over time, too, if more layers of shingles were added to the original roof. Each layer adds nail holes to the layers below it. Every hole, crack and void can lead to leaking. Also, if a new roof is installed over old shiplap, the nails holding the roof in place don’t go all the way through the shiplap. This means new shingles won’t be attached to the roof and can easily be damaged and start leaking. At Tony's Roofcare Inc., we can solve all these problems by resheeting, or adding exterior- grade plywood right over the shiplap. Then we attach new shingles to the plywood. It’s an effective, affordable way to ensure that your new roof will be free of leaks. 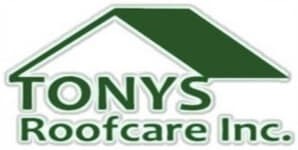 Tony's Roofcare Inc. uses only the highest quality roofing supplies and products on the market, and offers free estimates for all prospective clients. Schedule your consultation at (253) 841-7779 or submit our online contact request form.